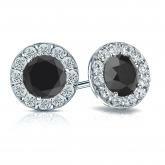 Certified 14k White Gold Halo Round Black Diamond Stud Earrings 3.00 ct. tw. Halo set diamond stud earrings with a total carat weight of 1.80 ct. black diamond center stone make a stylish statement in beauty and with 1.20 ct. total weight of small round diamonds as side stone, this 14k white gold stud earrings has a total weight of 3.00 ct. sparkling black and white round diamonds and are available with push-back, screw back or lever back clasps. 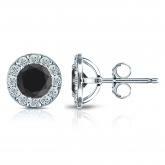 Certified 14k White Gold 4-Prong Basket Round Black Diamond Stud Earrings 3.00 ct. tw. 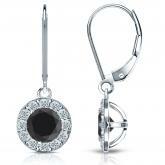 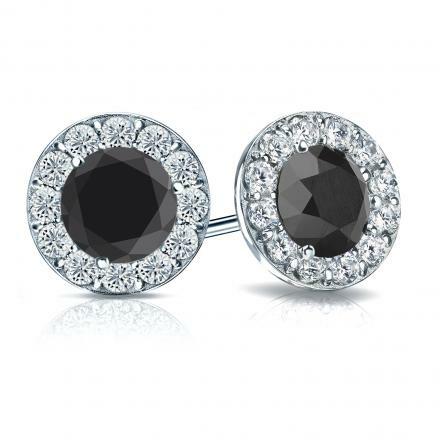 Certified 14k White Gold 3-Prong Martini Round Black Diamond Stud Earrings 3.00 ct. tw. 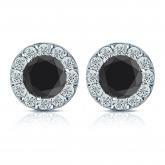 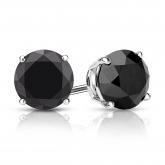 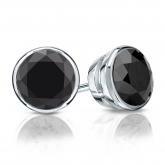 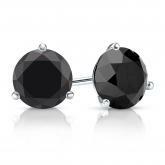 Certified 14k White Gold Bezel Round Black Diamond Stud Earrings 3.00 ct. tw.